Doctor Who has always been a show that has transcended its television origins. From the very beginning it has managed to spawn off into all sorts of different mediums from annuals to novels to audio drama and video games. One of the earliest mediums to be conquered by the Time Lord was comic strips. It first entered the pages of TV Action way back in 1964, (fifty years ago this year) the good Doctor has since gone on a variety of adventures throughout many comic titles. 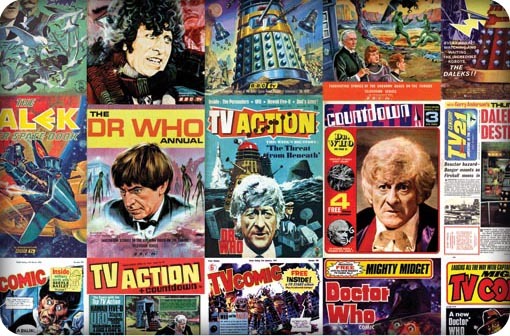 The Comic Strip Companion examines the first fifteen years of The Doctor’s existence in comics, his entire run in the pages of TV Action (and its many other variation titles) as well as the exploits of his greatest enemies, The Daleks in the pages of TV Century 21. Paul Scoones’ look at the history of The Doctor in comic strips is masterfully done. Each comic strip is examined individually with a plot summary of each episode followed by a quotation from the story before looking at the continuity of the strip followed by a summing up of what he thinks of the story. Scoones manages to get a real sense excitement with each strip and makes the reader actually want to get up and read the comics. No matter whether the plot is absolutely mad, like the one which involves the Quarks constructing giant bees to kill The Doctor, or not, Scoones manages to get a sense of true wonder into his writing. You can tell that he enjoys the mad cap nonsense of the strips just from the way he writes about them. However, not all of the strips are just nice mad nostalgia, some of them are, in fact, well written comics which for their time were pretty ground breaking. Such tales as the 1972 strip Sub Zero for instance, sound better than some of the things that the programme was producing at the same time. Scoones also manages to give great insight into how the strips were actually made as well as the reason that such characters as Ian, Barbara and Susan weren’t featured and why had two grandchildren. Another interesting insight is into how the strips slowly began to create their own continuity and eventually tried to fit the continuity of the comic strips in with the TV shows. Scoones brilliantly manages to make sure every single reference back to a past story appears which is commendable on its own due to the size of his task and the lack of other books on the subject. The one drawback to The Comic Strip Companion is the lack of pictures. It would be nice, now and again, in-between the large chunks of text to see an image of something from the strip you are reading. It is understandable, however, that not that many pictures feature as presumably the various copyright payments that would be needed might be too much for the size of the book. This is compensated for slightly by a selection of various covers featuring The Doctor appearing in the middle of the book. All in all, The Comic Strip Companion is a fantastic read that delves deeply into an area of Doctor Who that isn’t often touched upon. Expertly written and wonderfully detailed, this book is a joy to read and I would highly recommend that you purchase a copy. With thanks to Telos books. You can purchase the book directly from Telos here and Amazon here .